FACT CHECK: Did President Trump's Lawyers Send Berkeley Breathed a Cease & Desist Letter? Did President Trump’s Lawyers Send Berkeley Breathed a Cease and Desist Letter? A satirical letter shared on the cartoonist's Facebook page was widely believed to be legitimate on social media. 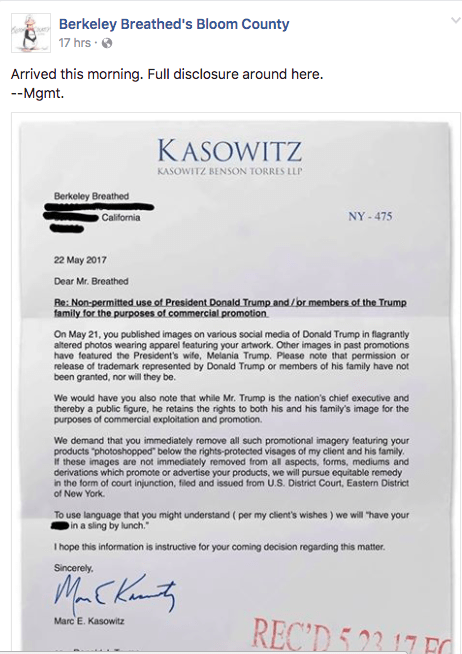 President Trump's lawyers sent a cease and desist letter to a cartoonist for using doctored images of the Trump family.